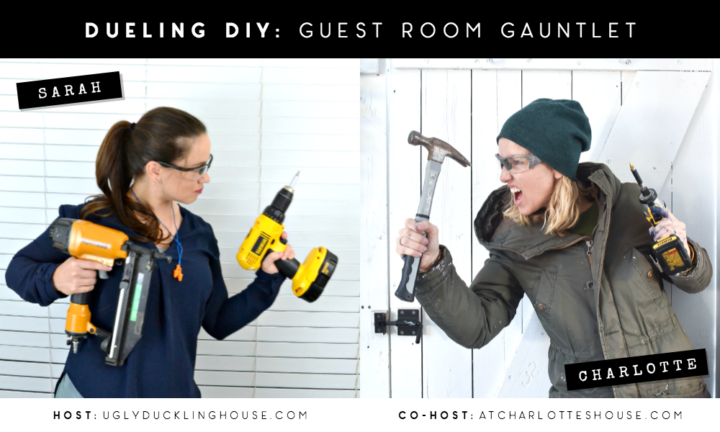 My friend Charlotte and I are in a DIY battle to renovate our guest bedrooms. Catch the entire series here. Hey friends! 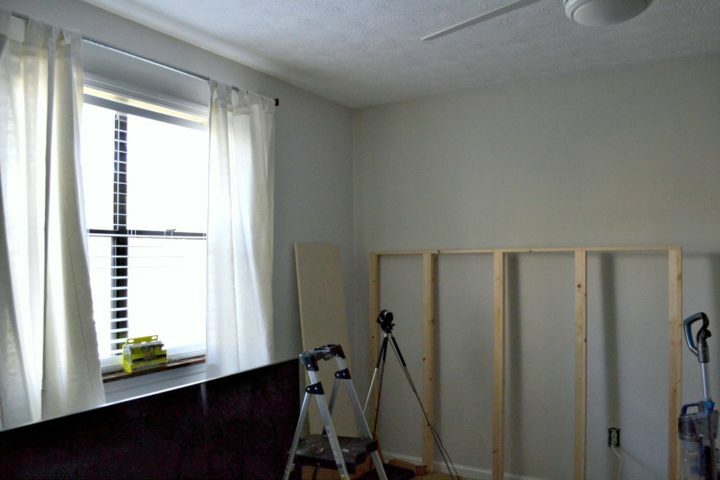 It’s Wednesday, and that means it’s time for another Dueling DIY update on the guest bedroom’s progress! If you need a recap, start here and check out the update here. As promised, I also have vlog #2 for those of you who want video updates at the bottom of this post. I’ve been keeping up with her progress mostly through her Instagram stories, but we also got the opportunity to see each other recently at a conference in Atlanta called WorkbenchCon. 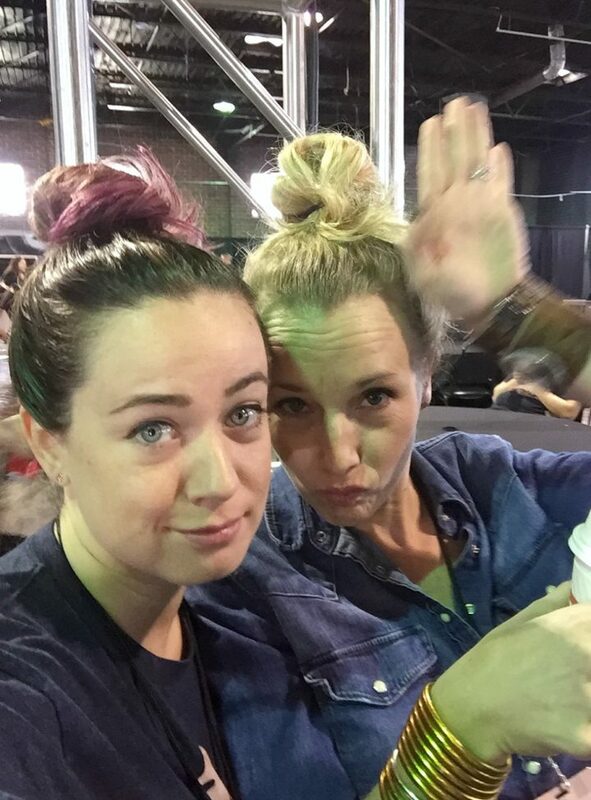 We enjoyed each other’s company (mostly) and put away our smack talk for a little woodworking fun… and making faces. Truth be told, I knew she was getting a lot done these last two weeks and felt very behind. That is, until this past weekend. Things have really started to fall into place! First, I had K help me move out all of the old furniture, I broke down the old bed, and put the mattress in the living room. While we still kept the big TV in the bedroom, we took it down from the walls so I could do some painting. Ready to see the new color? 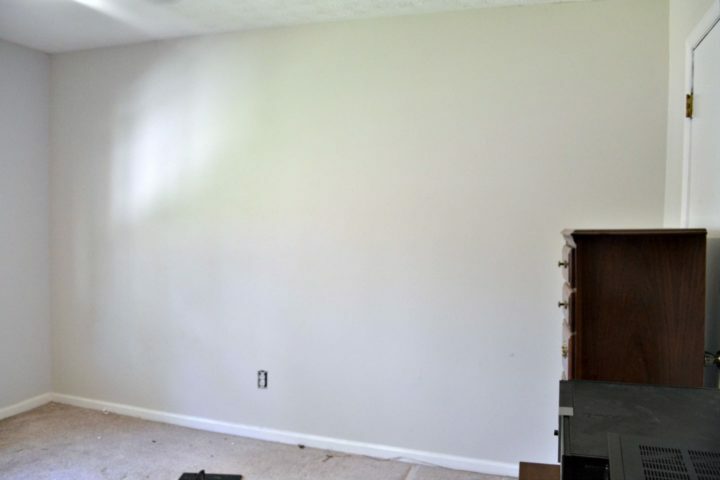 Obviously, that’s just coat #1; there was a second, and that wall on the right had already been painted as of the last update (the same color will also be used on all of the trim work of the built-ins). 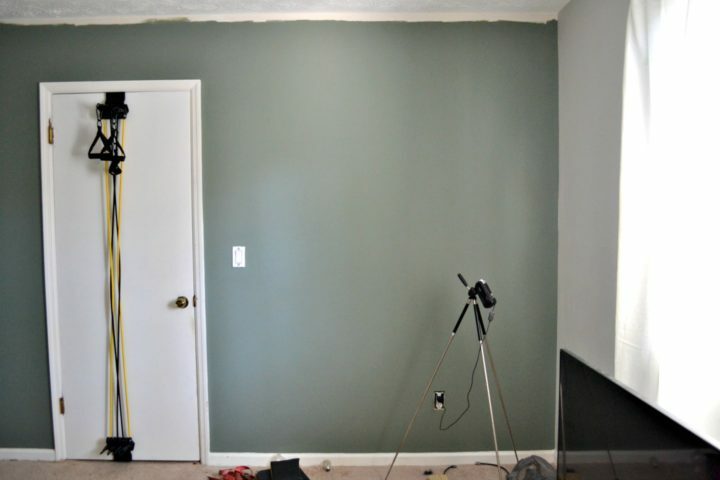 The dark sage green paint color is Retreat by Sherwin-Williams. Murphy bed hardware is in! Building has begun. If you recall from the mood board and the last update, I’m planning on doing a whole wall of built-in storage, complete with a Murphy bed. I hadn’t yet announced the reason for that design in the original post, but after sharing the news that K and Stella officially moved in, it probably makes more sense now! This room will serve double-duty as K’s home office and house a lot of his personal collections (he has a bunch of cool vintage cameras, for one). 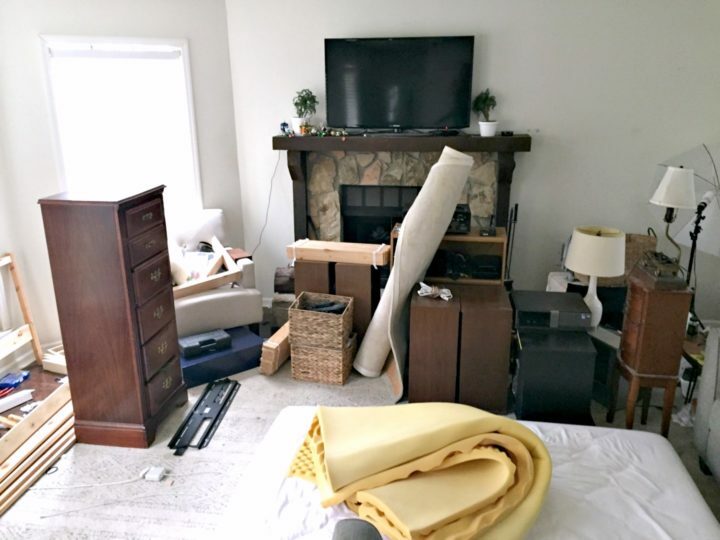 We had a lot of things to consider for how to best use every square foot, so the Murphy bed/built-in situation is perfect for providing plenty of room for an office and keeping the bed tucked away until it’s needed by guests. And, speaking of this big project, the Murphy bed hardware arrived in the mail, along with jigs and cabinet hardware (Rockler, very generously, is now sponsoring the project and sent me all the hardware I’ll need to install). To start the build, I had to make the bottom frame and side rails, which takes us all the way to page 18 of the instructions. It’s pretty much one of those things you want to make sure you get right (very dangerous if you don’t!). So, I’m following the install very closely and will have a full post all about that for you when I’m done. Do you like that TV placement, right in front of the only window and source of light in the room? Yeah… kind of awkward, but it’s the best option while everything else goes in (most of the old stuff will be sold/given away, but the TV is staying!). And do you want to know some UDH trivia? Those curtains above are the first official curtains I’ve hung in the house. It took eight. years. Other than the faux Roman shade over the kitchen, everything else has been blinds! I have them hung, temporarily, to see how much I’ll need to hem (still working on finishing the curtain rod). I’m not really crazy about the tabs at the top either, so I may end up snipping them off and using the top hem instead. Normally, I find a color of paint I like and then color-match it to a paint brand I know well (BEHR and Olympic have performed relatively well for the price for me). But this time around, I decided (just for the heck of it) to try out a new-to-me paint line called Ovation (HGTV Home by Sherwin-Williams). 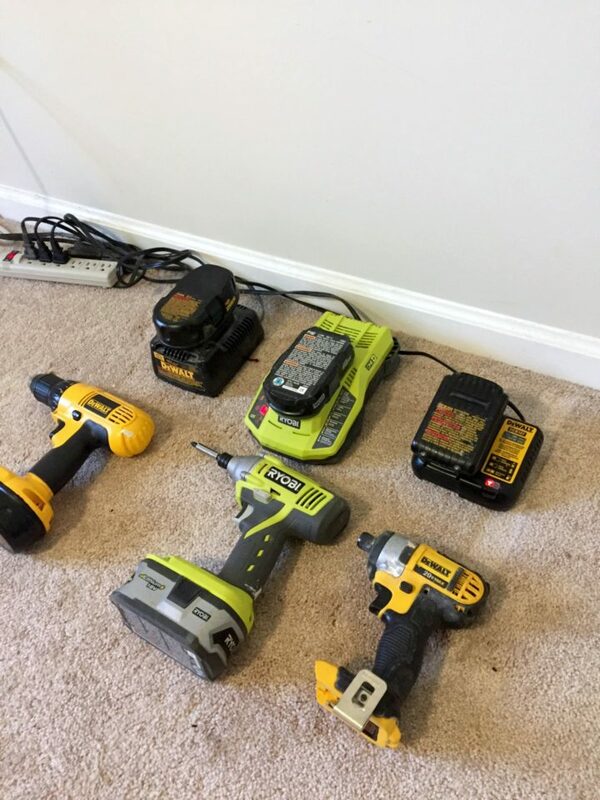 Since part of what I do on this site is try out new DIY products, I like to know about paint lines and how they perform (coverage, flashing, streaking, cost comparison, etc.). To be honest, while I love the color, the paint itself performed just ok… nothing special, but got the job done. The paint was somewhat thick, but left a lot of bare spots and streaks on the first coat, and the second coat appears to have given full coverage. Since it was a little higher of a price point than my go-tos, I expected a little better performance, but it’s not like it peeled off my walls or anything (that has happened when I was asked to review a paint line once, many years ago; as you might expect, I declined to publish about the brand after that!). 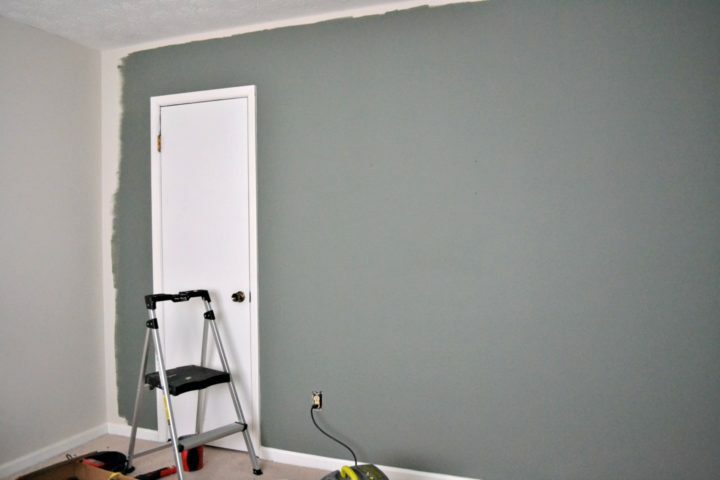 For two walls, I used a little over half a gallon, so I’m not 100% confident it would have allowed me to paint the entire room with just one gallon (for comparison, the size of this room would normally need one gallon with the other brands). That’s it for this week’s update! More DIY ideas are well on the way! Don’t forget to go over to Charlotte’s blog to see more of her progress, tease her a little on my behalf, or just tell her the bed she’s worked really hard on all week looks like a pile of dog vomit (kidding, don’t say that… just secretly think it). Hope you’re having a great week so far! Wanna see past Dueling DIY challenges? Check that out here! I love the green! I am so torn when it comes to Sherwin-Williams paints because they have such lovely colors, but I don’t care for the actual paint at all. I’ve used it in my guest bedroom and the adjoining bathroom as well as in my dining room. The bedroom is the only room where the color came out looking like the paint chip; in the two other rooms, the paint cured to slightly different hues than expected. Needless to say, those are the two rooms in my house that I am itching to repaint. I’ve decided it’s BM Aura for me or bust. The Aura paint is incredibly easy to work with, and the coverage is outstanding. Anyway…looking forward to seeing more progress! Thanks Kate! I’ve heard that line is great, but I haven’t tried it out myself. I suspected that part of why I had high expectations was from the SW name, but then again, I bought the paint from my local hardware store rather than an actual SW retailer. So, kind of like when people license out designer names at Target, I’m probably not getting the same quality. 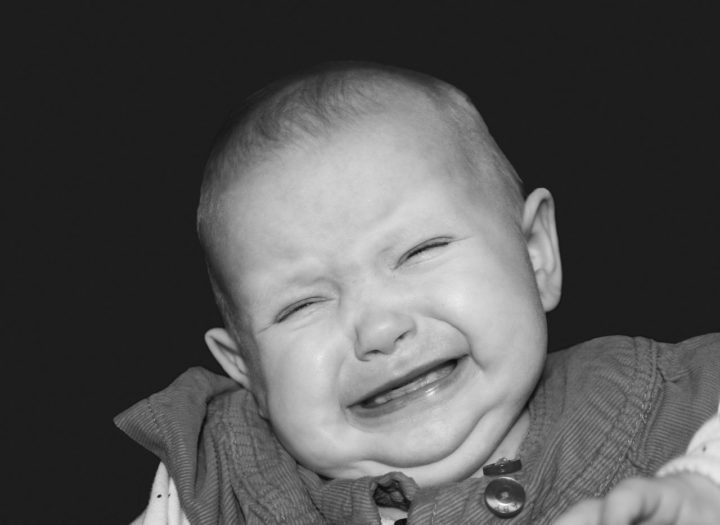 But then again, that’s kind of the point to lending a name: the enticement to buy it because of the name. So, “meh” is about all I can muster to describe that paint line and don’t know if it says anything about other SW lines or not. But glad to learn from others who have given it a try. I’ll have to check out the Aura line in the future! Maybe for the master bedroom since it’s looking like I might have to repaint (I still love the color, it just has some fading and a large patch and I am not confident a match can be found to be perfect, so might as well give it a fresh coat of a similar color is what I’m thinking). Ooooh that green is BOLD. I love it! I also am in the alliance with all things Behr. 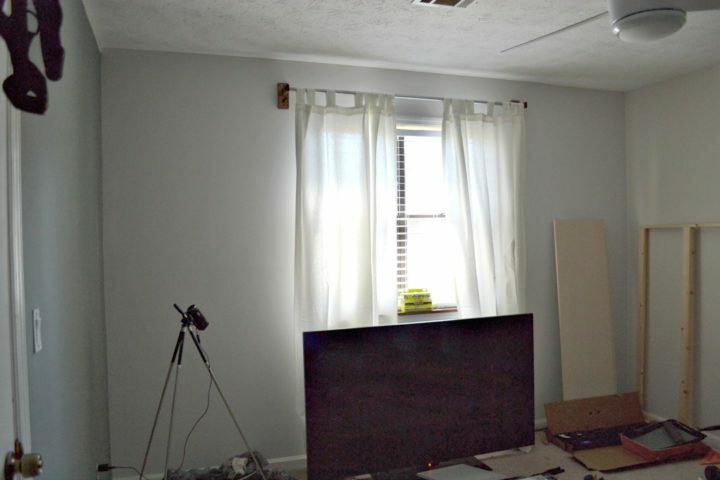 My house was painted entirely a dark grey by the seller when I first moved in (I suppose to hide the nicotine stains…) and, since it is only 776 square feet, it made the house feel so small. I chose a cream color to go over it and started with the cheap stuff which was a HUGE lesson learned, and swapped to Behr shortly after. I am probably too scared to try anything ever again haha, the Behr just worked wonders! 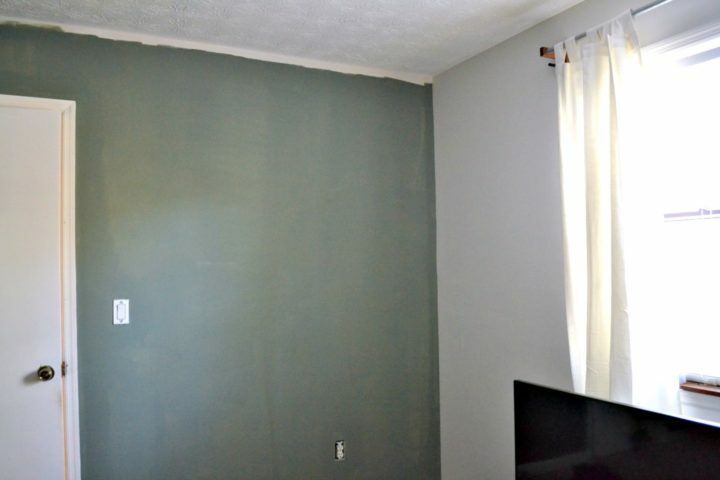 My mom used Behr and it was all I knew growing up… stuck with it for a long while but have figured hey, I’m a DIYer, I should try out some paint lines to see how they all compare to each other. 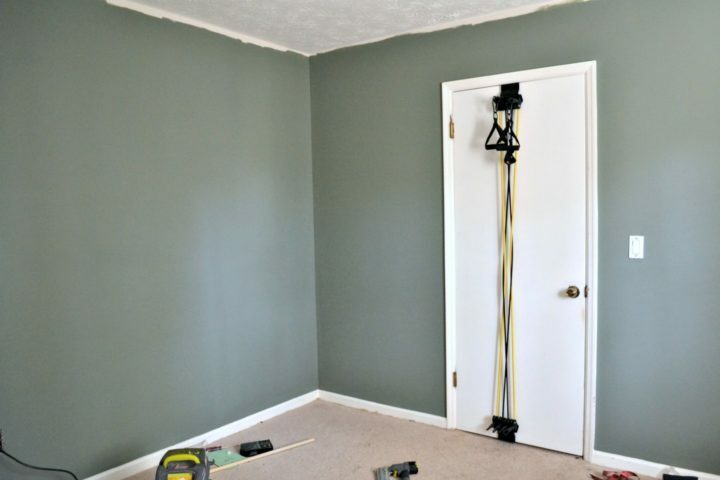 I truly like the BEHR and Olympic lines a great deal and have also used Glidden (I love their “gripper” primer for covering over drywall repairs). Thanks for the thumbs-up on the green! Looks great! 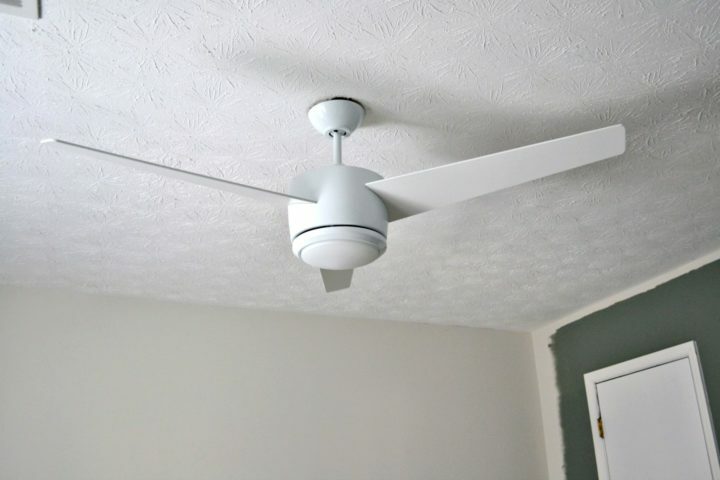 Love the propeller style ceiling fan. 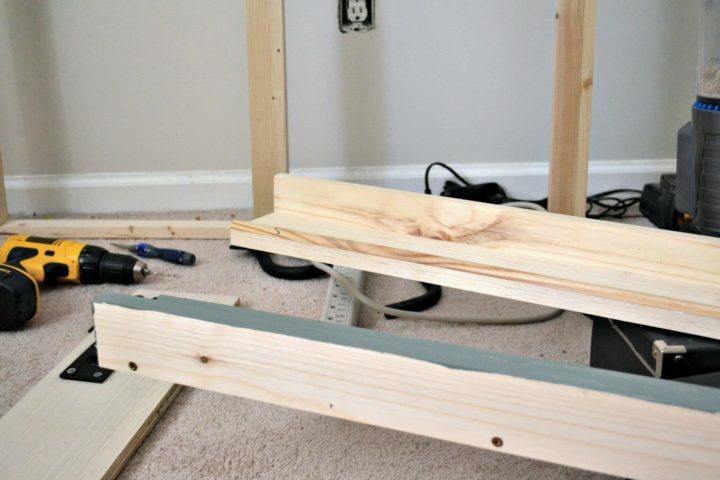 Ok, Charlotte builds a bed frame … you’re building a concealed wall bed creating a dual guest room office … no contest! Pffft, Miss C! Dueling DIY, cool idea, hadn’t heard of doing this. Nice work on the project, results look good.